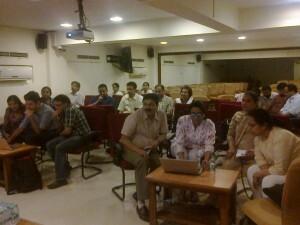 The third workshop of 2013 was held in Jaslok Hospital, Mumbai on Saturday, 23rd March 2013, between 4 pm and 7.30 pm. Vasumathi Sriganesh & Lakshmi conducted this one. We had been trying to do this for quite some time at Jaslok. Drs Sanjay Nagral and Rajesh Sainani helped us plan it out, and were assisted by Dr Pravin Agrawal. Though they initially hoped that a good number of DNB residents from their own hospital would sign up, the final participants were a mix of only a small group of residents, and more of faculty from their own hospital plus a few from neighbouring hospitals. We had around 20 participants. We also asked them what made them sign up for this program and everyone said they hoped that they could make better sense of PubMed. At the end of the workshop participants had a much clearer idea about how to search for topics very clearly, how they could save their searches and collections and also about the need for a reference management software. One more doctor asked “When will you have your next workshop? I wish to learn the more advanced features”! Thanks once again – Dr Pravin Agrawal, Dr Rajesh Sainani and Dr Sanjay Nagral for organizing this workshop. We hope there will be more and that all your DNB students participate! This entry was posted in 6 - Old posts and tagged Jaslok Hospital, PubMed. Bookmark the permalink.